>I've been meaning to send this for ages, and finally got around to it! 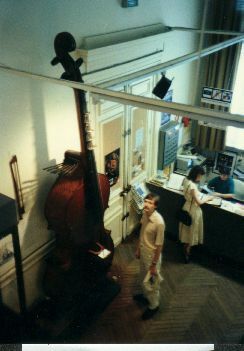 >Instrument Museum in July 1987. >photo was taken from a balcony above. >have these strings at their full length and power. >Sorry it's a little blurry, but at least it gets the point across! >your website and refer cb-l subscribers to it there. >>have these strings at their full length and power. larger bodies to effectively radiate their fundamental frequencies. Craig mentioned making a contra-sized Rovner type ligature. Rover actually makes a contrabass clarinet ligature-- I ordered one through my local music store. All the Rovner ligatures are the same price, regardless of size, and come with a plastic mouthpiece cap. They're priced so reasonably that its probably not worth trying to make one. > >>have these strings at their full length and power. > larger bodies to effectively radiate their fundamental frequencies. stopping mechanism based on the descriptions I'd read. Just a note to say that I'll be in California for a couple of concerts and two premieres of my music. April 10th János Negyesy and Päivikki Nykter will premiere my composition 'Negyesy's Gallery', twelve duos for two violins based on the computer paintings by János Negyesy. My piece is about 30 minutes long and there are two other premieres on the program. There should be some interesting multimedia as well. The concert is in the evening at the University of California, San Diego. I think the hall is still called Mandeville Center but please verify before coming. April 16th at 8 p.m., Catherine and I will play at UCLA in Schoenberg Hall. The concert will consist of compositions by Chausson, Ohana, Debussy, Mabry, and improvisations by our duo, Résonance Duo. Gary Gray will play with us in both the compositions and the impros. Unfortunately due to the inconvenience of travel I'm not bringing my lowest instruments. I'll be playing my sopranino, soprano, and tenor bamboo clarinets, wooden saxophone, and my single reed oboe. This summer I plan to finish my design for a more compact travelling contrabass bamboo clarinet. I would be happy to see anyone from the list - stop by and say hi.